"A must for lovers of Regency genre romance." The grounds of Harrowcot Hall are modelled on those of Harewood, a stately home near Leeds, which I visited in October 2011, while the set up of the house itself - with two courtyards, one in the main part of the house, the other in the service area - is based on Dunham Massey, another stately home. 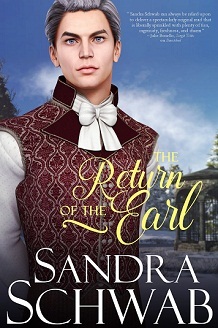 Want to know what writing The Return of the Earl was like? Check out #returnoftheearl on Instagram for Con & Bryn's status updates! for a second chance at love? "What elevates this novel is [...] the language and the research that have gone into the accurate portrayal of the Regency era and the traditions of the times. [...] I liked the idea of a gangly, innocent young man in love who is changed and emotionally frozen by a betrayal then returning as a man who, during his absence, has earned the soubriquet of the Ice Prince. The man is frozen, the landscape is frozen – both waiting for love and warmth to bring them back to life." "Onto, Bryn – the stablemaster whose betrayal sends Con into brood mode. Ohhh, he’s delicious and swoon-worthy. He’s a strong man who loves horses and treats them well – what’ not to love? A fan might be needed around him." Con walked on, hands on his back, looking this way and that, reacquainting himself with the grounds he had once known so well. With the fog gone, they looked far more pleasant than they had the day before. If he could take a ride each morning, his short stay at Harrowcot Hall might be just about bearable. He would see after the business Ross had been urging him to look into, meet his father’s solicitor—now his, he supposed—and if all went well, he would be back in London by Christmas. Or even earlier. As the path curved, it opened up the view of the stableyard that was hidden from the house by a copse of trees. When the modern incarnation of the hall had come into existence, the stables had been remodeled as well. They now consisted of two-storeyed buildings arranged around an inner courtyard, with roomy boxes for the horses, a well-proportioned tack room, coach houses, and accommodations for the stablehands and the stablemaster. Con walked on, his mind firmly focused on the ride ahead. He passed through the large front gate into the courtyard, where he hailed a groom. “Where’s the stablemaster?” he asked, because surely, greeting Old Ellison was the right thing to do, and the man could also recommend one of his brilliant horses to Con. After a nod of thanks, Con walked over to the building the youth had indicated and pushed the door open. Instantly, he was assailed by the familiar smells of hay and horse. Something inside Con unknotted, and for the first time since he had returned to Harrowcot Hall, he felt his shoulders relax. He had always loved coming to the stables, and Old Ellison had always had a kind word for him. Slowly, the man straightened and turned—and it was only then that Con realized it wasn’t Old Ellison he was talking to. No, it was the stablemaster’s son. All the breath seemed to leave Con’s lungs at once. He hadn’t changed much in thirteen years. He was still tall, still broad-shouldered, the brown hair still shaggy, still hanging into his good-humored face. And he still favored wearing those ridiculous woollen ganseys over his shirt instead of a proper coat. He knitted the things himself, just as his mother had taught him before she had died from scarlet fever. As if from a far distance, Con heard his own voice, “I was looking for your father. The groom said I was going to find the stablemaster in here.” His tone was cool and steady, he noted with relief. For a moment, all Con could do was to stand and stare at him. As if some kind of floodgates had been opened, he was mercilessly battered by memories. Memories of how that smiling mouth had felt moving over his with teasing gentleness and hard demand. Memories of the broad, muscular body underneath the shoddy clothes, of the way his skin had felt against Con’s. Memories of coming apart in this man’s arms, gasping his name. And he remembered his father’s voice, “If you go, I’ll let the stablemaster’s lad stay. Wouldn’t find any work without proper reference, the boy. It’s your choice.” And of course, he had gone because he had been more worried for Bryn than for himself. And later, it had all been ripped apart by those hateful words in the letter which the earl had sent after him and which Con had thrown into the fire. The stableboy says, given your station, he felt unable to resist your advances. Had to pay him a fine sum to keep him quiet about my degenerate son. A fine burden this is, having to look at the man’s knowing smirk day in, day out. It’ll be your fault if I have to pay him even more and give him a glowing reference to make him go away. And with that he turned and strode out of the stables and across the courtyard, and walked away from the stableyard, and walked and walked, and tried to not remember. not noticed the man’s eyes crinkle at the corners. The light in the stables had been too dim to discern their color, but of course, Con knew. The memory had been burnt into his mind so deeply he would never be able to forget. Those familiar, two-colored eyes. Muddy-green and stormy-blue. The way they had looked at him when Con had lain naked on the floor. Despite the cold, his cheeks turned hot with embarrassment. What a damn fool he had been.